Switching over to Google Docs from another document software is easy. If you have existing text documents, such as Microsoft® Word® or Adobe® PDF files, you can import and convert them to Docs. Click New > File Upload and choose a text document from your computer. Supported files include .doc, .docx, .dot, .html, plain text (.txt), .odt, and .rtf. 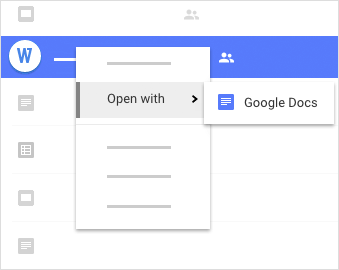 Right-click the file you want to convert and select Open with >Google Docs. Converting your document from another program creates a copy of your original file in Docs format. You can then edit it in your browser like any other document.